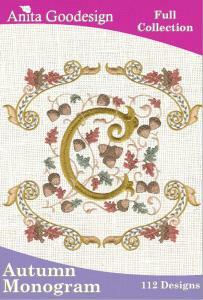 Autumn Monogram has unique embellishments swirling around & over top of each letter. Embellished letters are available in 2 sizes 4"x4" & 5"x7". Unadorned letters in 2 sizes are also available along with 8 different motifs to go along with the monograms. By arranging & mirroring the motifs you can create beautiful quilt blocks & large monogram designs.